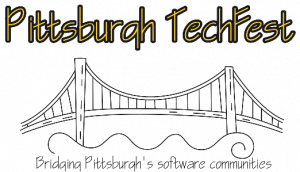 We are a Gold Sponsor for this year’s Pittsburgh’s Tech Fest! There are a large selection of sessions covering a variety of topics from Effective Data Visualization to Mobile First for Responsive Design to The Hipster’s Guide to NLP. You can check out all of the sessions, their times, and a brief description here. We’re certain you’ll find something you’ll like so while your on the page, feel free to check out ticket prices and volunteer opportunities.